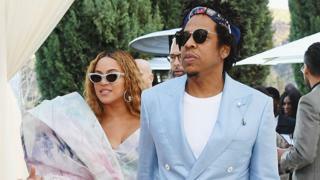 Beyonce says she was "overwhelmed" at getting recognition at the 2019 Glaad awards, along with her husband Jay-Z. The superstar couple were honoured by the organisation for their work promoting LGBT acceptance. Beyonce dedicated the couple's vanguard award to her uncle who died from issues relating to HIV. "Witnessing his battle with HIV was one of the most painful experiences I've ever lived." "I'm hopeful that his struggle served to open pathways for other young people to live more freely. During her speech, she also said that a tribute performance from A Star Is Born and RuPaul's Drag Race star Shangela left her with torn tights. "I've already cried, I've got a run in my stockings from Shangela," she said while collecting her award. Shangela performed some of Beyonce's biggest hits in front of Beyonce and Jay-Z - who also spoke at the ceremony. "Thank you, GLAAD, for this amazing honour and having us this evening," said Jay-Z. "Life, this journey, is filled with highs, lows and a lot of learning. This is a momentous night and I also want to honour my mother who received an award last year." Gloria Carter, who is gay, won a special recognition award at the 2018 Glaad awards for her part on Jay-Z's track Smile. The Glaad award celebrates people, programmes, movies and moments that have supported LGBT rights. Love, Simon won outstanding film and Queer Eye won Outstanding reality TV programme. US series Vida, about two Mexican-American sisters who find out their dead mother was in a relationship with a woman, was named outstanding comedy series. See the list of winners here and here. Presenters of awards included Will and Grace star Sean Hayes who joked about the Jussie Smollett police case which has taken place throughout 2019. Sean said he had been using "the Smollett workout" to get in shape, telling the audience: "You hire two trainers and sweat for eight weeks."